We are considered a renowned name in the business, which engages in manufacturing, exporting and supplying Chain Link Fence Making Machine. Applauded and accepted in the industry for its ease of installation and constant performance, the proffered assemblage is vastly asked for. 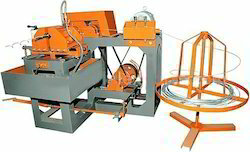 Chain link fence making machines are handed over in tamper proof packaging.